During the day, you might have been able to find her on the roof of parking garage A or F in her silver 2007 Chevrolet Aveo, where she slept in the front seats with her legs hanging out the window. She chose daytime because she figured it would be safest with her windows down. Some nights she didn’t sleep at all — those were the nights when she couldn’t find any friends to let her sleep on their couch. Most people who knew Nicole Stark in 2010 and 2011 had no idea why she consistently asked to crash at their place. She didn’t exactly go around explaining why, or that the reason her car was so messy was because she lived in it. “It was like musical chairs of sleep. And it was humiliating, so sometimes I would lie and just try to go elsewhere,” recalled Stark, who is now a 2015 UCF alumna with a master’s degree in applied sociology. Josh and Rachael Simpkins, who have both known Stark for years, were oblivious to her situation, even as they allowed Stark to stay at their individual homes during her time of adversity. “I remember Nicole slept on my couch off and on … I remember that she mentioned being between places, but didn’t think anything of it,” Josh Simpkins said. Josh and Rachael Simpkins never assumed anything after seeing her messy car either, but they remember it vividly. “It looked like you’d packed to move across town, but had to stop to get stuff out and repack over and over, so eventually [it was] just chaos,” Rachael Simpkins described. From fall 2010 to fall 2011, Stark tried to keep her secret while she posted on Facebook and emailed people requesting a place to sleep for the night. Stark didn’t have a home address, so she was unable to use the public library after the school closed. For internet access, she paid by the hour or bought day passes at Next Level LAN, a gaming center in Winter Park that closed down in 2012. Chownwai sometimes would talk to Stark when she spent her nights at NLL, but he wasn’t fully aware of her situation. Stark first became homeless after being kicked out of her emotionally abusive ex-boyfriend’s home, she said, at the end of a two-year relationship. Before she moved in with him, she commuted an hour from Cocoa Beach to Valencia College. In order to avoid moving back to her mother’s place and having to commute to UCF during her junior year in fall 2010, she started couch surfing and living out of her car. In addition to attending UCF full time, Stark would work 20 hours each week at Blockbuster, earning a mere $500 a month. She was able to muster up around $1,000 every time school semesters ended to pay for school fees and books. Her circumstances became more difficult in January 2011 when Blockbuster went out of business, causing Stark to lose her only source of income. So she took online courses to avoid needing to be on campus often. She moved back home to Cocoa Beach to live with her mother who, Stark said, suffered from drug addiction. Public court records show her mother was found in possession of drugs, such as cocaine and cannabis, three times from December 2004 to June 2006. Within a month of moving back, her mother stole her car. Stark called the police and eventually got her car back, while her mother was sentenced to two years in Brevard County Jail for grand theft auto, according to Brevard County’s criminal court records. For the summer, Stark lived with her grandparents near Ocala and took online classes while working at Target. 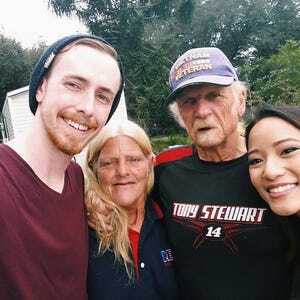 She never elaborated on the details of her dire living situation in Orlando to her grandparents. Once the fall semester came around, she ended up needing to take on-campus courses again. Deciding that she could do it all again if she had to, she reverted back to what she termed “being transient” to avoid commuting 90 minutes just to attend class. During fall 2011, she lived off $300 checks her grandparents would send each month. She didn’t find steady employment again until 2012, when she became a temporary research assistant at UCF’s sociology department. In retrospect, Stark believes she learned a lot from her “hellish time” by developing a strong sense of independence and an appreciation for the kindness of strangers. Despite her challenging experience, Stark survived. The stress of those days left her with an anxiety disorder that caused her to suffer recurring panic attacks. She has since recovered and now proudly teaches sociology as an adjunct professor at Valencia College. She plans to get a Ph.D. in sociology and has been living with her platonic life partner Shannon since 2011. Shannon was the last person to take her in. UCF Cares, an initiative to improve students’ health, safety, wellbeing and academic success, offers various programs and resources students can use to find support during adversity. Their programs include Knights Helping Knights Pantry, which provides food and toiletries to students in need, and Student Rights and Responsibilities, which assists students in finding temporary housing and financial support. “You’re in college to build yourself up, and so is your school,” Stark said. “And sociologically, college is the greatest determinant of social mobility in terms of income. I tell my students that all the time, especially my Valencia students, many of [whom] come from poor backgrounds, who were raised by single mothers.